"I, Jon Mamoru Takagi, was born in the year of the Horse, 1942, under the sign of Cancer, July 2nd at 4:15 a.m. in the beautiful city and state of Honolulu, Hawaii. My training in Aikido started when I was a junior in high school 1958-59. My instructor was Mr. Yukiso Yamamoto, 6th Dan. My main reason for taking Aikido was to improve self-confidence, to co-ordinate mind and body, and to help live in peace with all people. In 1961 the founder of Aikido, Morihei Uyeshiba, O-Sensei, came with Tohei Sensei to dedicate the new dojo Hawaii Aikikai. "In 1966 I left Honolulu with my motorcycle and came to the mainland to travel West to East and North to South. This trip took me thru 36 states, Canada and Mexico. While in New York City I trained under Mr. Yoshimitsu Yamada, 6th Dan, for a short time. While there I decided that I wanted to share my knowledge with others. 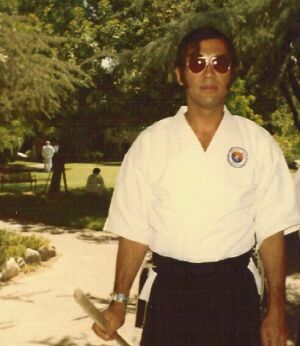 "I came to Phoenix, Arizona in 1968 and started to teach Aikido at the Y.M.C.A. A student found me a building which I bought so that Aikido could always have a home in Arizona. With the help and encouragement of Mr. Isao Takahashi, 7th Dan, and Mr. Chester Sasaki, 3rd Dan, we got off to a good start. One of the highlights of the Arizona Aikikai dojo was when Master Koichi Tohei with Mr. Rodney Kobayashi, 6th Dan, visited us in 1970 and again in 1973. "Classes are held at Arizona Aikikai weekday evenings and on Saturdays. Every year I have instructed classes in Aikido for two of the Maricopa Junior Colleges and am currently teaching How to Develop Ki to a Karate Club and to the F.B.I. staff." This brief autobiography was probably written by Takagi Sensei in the mid-1970s, but the actual date is uncertain. The dojo he references was on First Street south of Roosevelt Street in downtown Phoenix. Takagi Sensei lived and taught there until his death in February 1984. By that time he had helped Fumio Toyoda Sensei, 6th Dan, found the Aikido Association of America, and was, himself, 4th Dan. Toyoda Sensei awarded him 6th Dan posthumously. Takagi Sensei was an outstanding Aikidoka. He was always attending seminars and trying to increase his knowledge of Aikido. He was also an excellent and very demanding instructor. His memory lives on in all of us who trained with him.